Ubuntu 12.04 Development Update 18 - OMG! Ubuntu! We are only five weeks away from the release of Ubuntu 12.04 LTS. Next week we expect the Beta 2 release to go out and afterwards only important fixes will go in. 26th April will be the day when we all can celebrate our hard work and enjoy this fine piece of work which will be supported for five years on the desktop and on the server. If you haven’t yet upgraded to 12.04 you might want to consider this and test the hell out of it. For everyone who wants to get their hands dirty and fix bugs, you might want to consider if your bug in question is important enough to be fixed in this release or if it better waits until 12.10. The next release is still going under the code name of ‘Q’, although we all hope our favourite cosmonaut announces the new name soon. If you are new to the docs and everything, consider joining our User testing effort (give feedback, get help). Jorge Castro a juju hacker talks about saving OMG! Ubuntu! with a juju charm. Jonathan Riddell talks shop of the state of free consumer software. Jeremy Bicha of the Ubuntu Desktop Team makes a call for contributions for Documentation. Late today the release managers will announce Beta 2 Freeze. The LoCo community is ramping up efforts to get more release parties up and running around the globe and 12 events have already been added to the LoCo Team Portal. On their list are: Palestine Territory, Australia, Czech Republic, Montenegro, Switzerland, Canada and USA. If you can’t find your city or country in the list, check out our instructions for adding your own party. We have three folks who managed to squeeze their first fixes into Ubuntu last week: JC Hulce synced apt-build from Debian, Aditya Vaidya fixed a bug in a manpage of vorbis-tools and Lars Duesing fixed a race condition in aiccu. Good work everyone! Rohan Garg received upload rights to Kubuntu! Congratulations! Also on our list of applicants are: Adam Gandelman (server + MOTU), Bjoern Michaelsen (LibreOffice) and Kilian Krause (MOTU). Good luck and all the best to the three of you! This week we reached out to Ubuntu Developer and Ubuntu Desktop Team Member Martin Pitt for a interview. Benjamin Kerensa: What do you generally work on? Martin Pitt: These days, mostly on improving pygobject and making libraries introspectable, and then GNOME/desktop related bug fixing all over the place. I have also done a fair share of work on power usage reduction in Precise, as well as some foundational work in PackageKit/aptdaemon for an upstream friendly way of installing missing language support and driver packages. Benjamin Kerensa: Do you still remember how you got involved in open source? Martin Pitt: That was during school, around ’96 or ’97. Our school got a new computer lab, and with it we set up a Linux (SuSE 5.0, as far as I remember) box to do the ISDN connection handling and routing and some other network services. A friend of mine was working on this, and the other day I sat on that machine and played around with it a bit. I was quite fascinated about real 32 bit support (so far I was only used to that clunky 16 bit programming under DOS), real multitasking, and the utter stability that Linux desktops provided back then, and really astonished when I learned about this “free as in freedom/beer” thing. So I took that SuSE box home with me, spent a week reading the manual and setup, and have fallen in love. From then on I booted back to DOS only for playing games, and were otherwise taking Linux apart. It still took until 2001 before I got my first patch accepted into Debian, and shortly after I became a Debian developer. Benjamin Kerensa: What do you like most about the new release? Martin Pitt: That we finally got serious about quality. The automated Jenkins tests, the acceptance criteria, and most importantly the changed mindset of “never break precise” and taking much more time for bug fixing really changed things for the better. It shows, both for myself in daily use, as well as that we seem to have had at least one magnitude more precise users, even in early alpha-2 times. 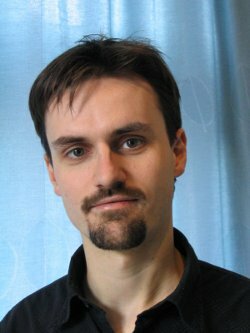 Benjamin Kerensa: What do you like most about Ubuntu development? Martin Pitt: The generally friendly and focused spirit in the community, and that both Canonical employees and volunteer contributors have the same rights, privileges, and processes to follow. I’m aware that we don’t always do this 100%, but at least from my perspective it generally works.